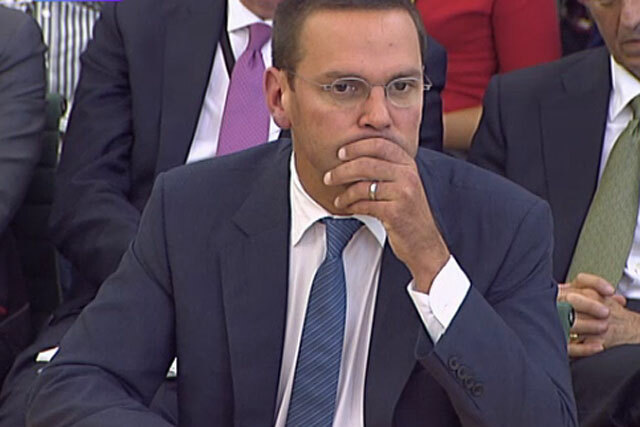 James Murdoch's evidence to the Culture, Media and Sport Committee was called into question last night when the former editor and lawyer of the News of the World contradicted his claim that they did not show him key evidence of phone hacking. The development has led to further speculation that the independent directors of BSkyB, of which Murdoch is chairman, will move to oust him from his role at the broadcaster in a crunch board meeting next Thursday (28 July). In his evidence on Tuesday Murdoch said he had not seen the email addressed "for Neville", which suggested that at least chief reporter Neville Thurbeck must have known about the phone hacking, which contradicted News International's defence at the time that the hacking was isolated to a single "rogue reporter" – Clive Goodman, who was convicted in 2007. The email addressed "for Neville" included the transcripts of 35 voicemails. Thurbeck continued to work at the News of the World until his arrest earlier this year and is currently on police bail. The email is significant because Murdoch claimed he did not know the hacking extended beyond one reporter when he signed off the £700,000 settlement for Gordon Taylor, chief executive of the Professional Footballer’s Association, in 2008. Murdoch reiterated to MPs that Colin Myler, editor of the News of the World until it was closed two weeks ago, and former legal affairs manger Tom Crone carried out the internal investigation in 2007, a fact not in doubt. But in a statement last night Myler and Crone contradicted Murdoch's claim that he had not seen the email, as the pair looked to protect themselves from being at the centre of any allegations of a cover up. The statement said: "Just by way of clarification relating to Tuesday's CMS Select Committee hearing, we would like to point out that James Murdoch's recollection of what he was told when agreeing to settle the Gordon Taylor litigation was mistaken. "In fact, we did inform him of the 'for Neville' email which had been produced to us by Gordon Taylor's lawyers." Murdoch, deputy chief operating officer and chairman and chief executive, international, of News Corporation was giving evidence alongside his 80-year-old father Rupert Murdoch, chairman and chief executive of News Corp.
Tom Watson MP: "James – sorry, if I may call you James, to differentiate – when you signed off the Taylor payment, did you see or were you made aware of the full Neville email, the transcript of the hacked voicemail messages?" James Murdoch: "No, I was not aware of that at the time." In response to the statemtent from Myler and Crone, James Murdoch issued his own statement that read: "I stand behind my testimony to the Select Committee." The phone hacking scandal has gathered pace over the last few weeks after it emerged the phone hacking at the News of the World is alleged to have extended beyond celebrities and politicians to murder and terrorist victims. In response to the crisis News Corp's UK publishing arm News International made the shock move of closing the News of the World two weeks ago and News Corp pulled out of its bid for the 60.9% of Sky it does not already own last week (13 July). Some people, including deputy prime minister Nick Clegg, have questioned whether News Corp is a "fit and proper" owner of the 39.1% of Sky it already owns. Over the past week speculation has mounted that a number of investors and directors of Sky think James Murdoch should step down as chairman. A Sky spokesman said: "The company has a very robust governance framework which has worked well over many years. The board is satisfied that the existing arrangements remain appropriate." Labour's Watson and BBC's Peston in Twitter spat as the News International story erupts again in UK and US with fresh FBI investigation - this time into whether Jude Law's phone might have been hacked while he was in the US. Read the full story here.